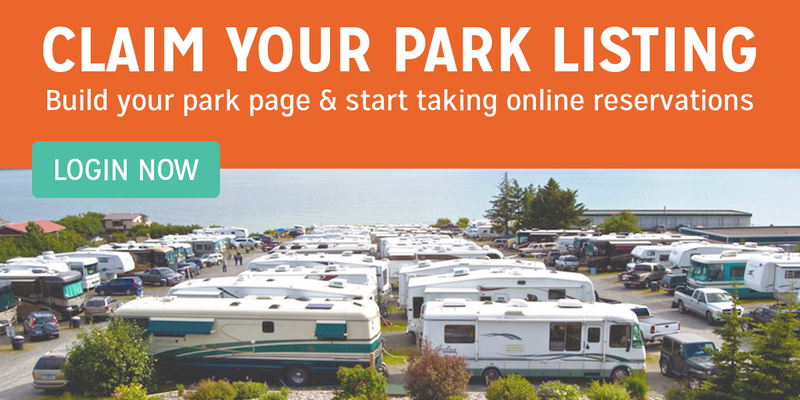 Experts estimate that Google considers around 200 different criteria when ranking and featuring the best designed RV park websites. The elements you include on your page determine how far up your site appears in web search results. For small businesses, figuring out how to snag one of the coveted, top-five positions can feel like a guessing game. The good news is that there is enough research to know some of the general rules web designers use to help a website crawl up the rankings ladder and get seen by more and RVers with a credit card in hand. Updated Content. You can do this in the form of blog posts, a virtual tour, and a calendar of events. Search Engine Optimization (SEO). The faster a search engine notices your site via relevant keywords (like your park name), the higher your website will appear in relevant search results. Social Media Presence. Google obviously responds well to businesses that are active on Google+, but it also helps to have backlinks from Facebook, Twitter, Pinterest and other social media sites. When visitors find your site through social media, it shows that people “like,” follow, and share your content with their network. Mobile Friendly. Experts predict that most of us will be using a mobile device for browsing before the end of the decade. If a fancy web developer tells you that your website is mobile friendly just because you can see it from an Android, find a new developer. “Responsive design” is a specific designation that indicates functionality on different sized screens. If your website is not responsive when a user is on their phone or tablet, it can be useless to people who primarily browse the ‘net on a handheld device. Contact Information. Legitimate businesses are not afraid to disclose their location and contact information. Web browsers look for a dedicated “Contact Us” tab, for instance. Include your business name, address, phone number, and email address. Including your contact information at the bottom of each page on your site is even better. Bonus: Online Reservations. This is not a point that’s high on Google’s algorithm only because it is relevant to only some businesses. But one way a browser assumes that you have a flawed website is if a user leaves after visiting just one page (this will up your bounce rate). So if a potential customer lands on your homepage and does not see a “Reservation” button, and then navigates to a competitor instead, from the web browser’s perspective, your site wasn’t able to offer that individual what they wanted. On the surface, it may be difficult to tell the difference between a highly ranked website versus one that ranks low. 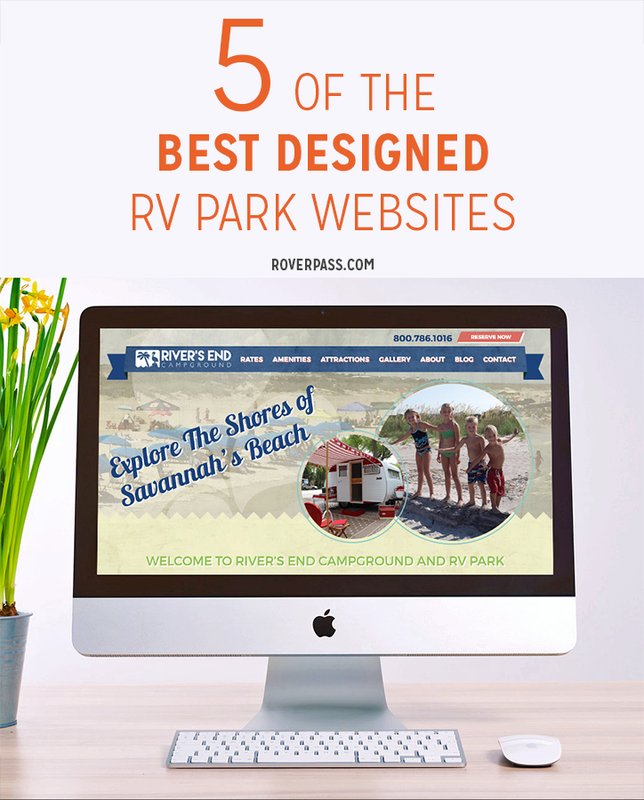 So we scoured the web to find 5 best designed RV park websites based on criteria experts say browsers look for. These RV parks, ranging from the northeast to the southwest, will give business owners an idea of how your competitors are doing it right. 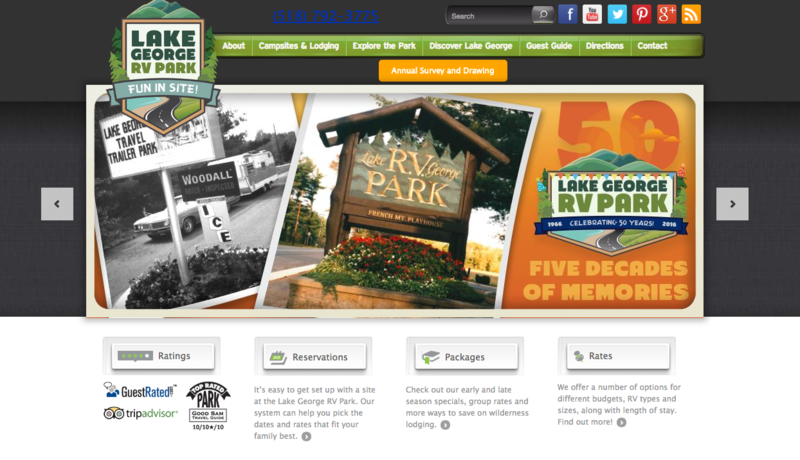 The website for Lake George RV Park proves that you don’t even have to go light on the bells and whistles. At the very top of the page, customers see a rotating photo gallery featuring the park’s sign and several imprints of the park’s logo, guests enjoying amenities, a family-friendly photo, and an image featuring a dog (people love looking at photos of pets online); next, customers will notice the buttons featuring Lake George’s reviews and review-site badges, a button that takes them straight to the reservations page; another link to a page that explains the different packages offered; and a separate page just for rates. At the top of the website are a series of social media buttons, plus a search bar. There’s so much useful information at the top of the fold (the top, viewable portion of the landing page) most folks will make reservation before they even scroll down to see the personalized guest reviews, a park map, and video tours. Google gives this site a perfect score for mobile-readiness. 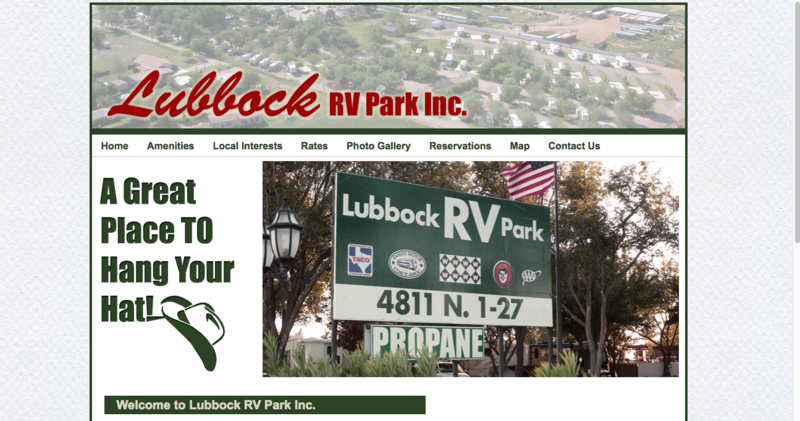 Lubbock RV Park in Lubbock, Texas may not have the prettiest website out there, but that’s not what Google looks for when ranking best designed RV park websites. 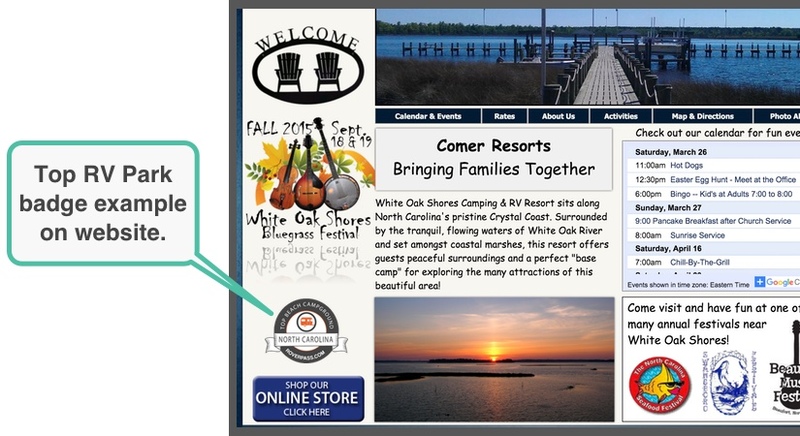 Instead, once a customer lands on the main page, there’s a large photograph featuring the campground address and at the bottom of the page, the phone number and email address are prominently featured. Lubbock RV Park has an easy-to-navigate reservation tab for users to search lot availability and to process payment. There’s a photo gallery plus a page that provides information about local attractions. Finally, according to Google, the park’s mobile-friendly ranking scores a perfect 100. 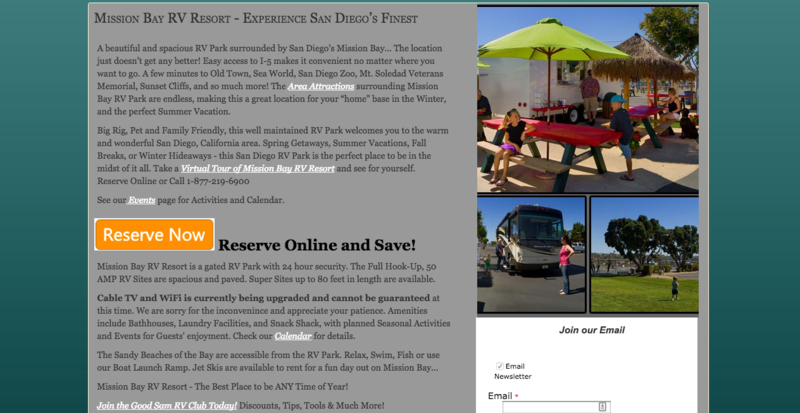 Have you seen the photo slideshow on the Mission Bay Resort main landing page? The images are simply stunning! After seeing San Diego’s twinkly skyline, waves crashing on coastal rocks, and the gorgeous sunset, there’s nothing stopping users from clicking on the large, bright orange “Reserve Now” now button. After submitting payment information, guests can take a virtual tour, view area attractions, and see the park’s events and calendar listings. All of these pages are updated regularly. At the bottom of Mission Bay’s landing page are several social media buttons, their physical address and phone number. The website received mobile-friendliness rating of “fair,” a 68 out of 100. But with a few tweaks, like font size and viewpoint configuration, the park can easily up their score. 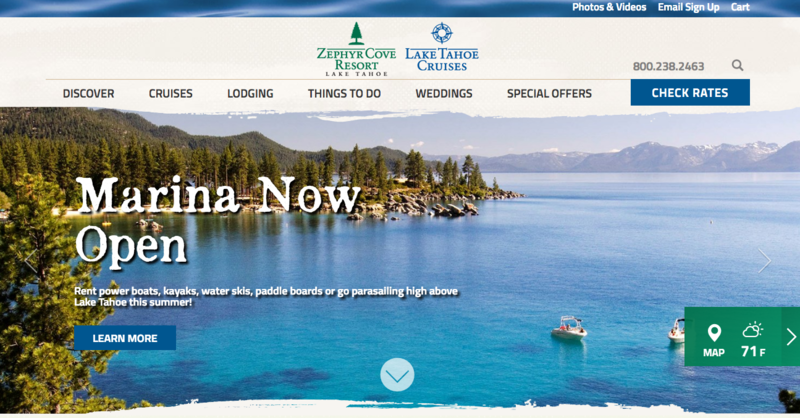 The sharp images on Zephyr Cove Resort’s main landing page are links that take users further into the park’s website. 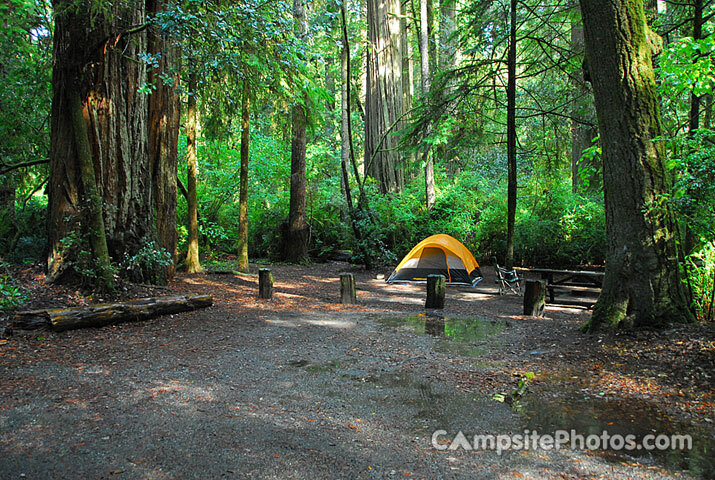 Customers can toggle between an activity calendar and information about the park’s RV camping options. After reviewing a sample three-day itinerary, customers’ next stop is the “Check Rates” button that hovers at the top of the page, no matter where on the site users venture. Also at the top of every page is a phone number, and at the bottom, the address, social media buttons, contact information, and a link to resort and area maps. Zephyr Cove’s mobile friendliness ranks a “good” 99 out of 100. 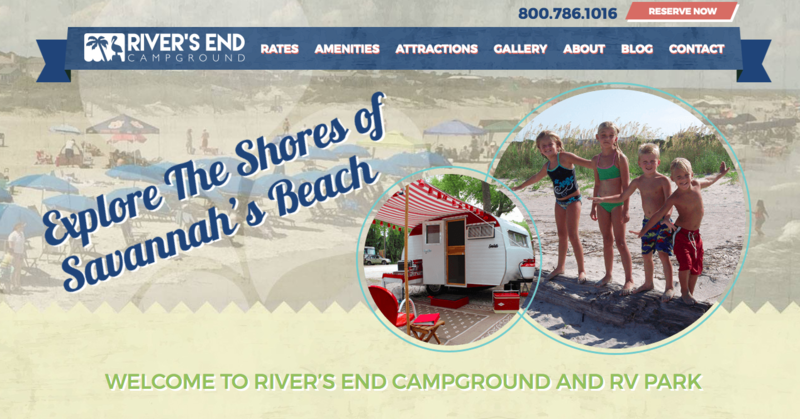 The first thing RVers will learn about this Tybee Island campground is that River’s End is a coastal wonderland with a rich historic background. 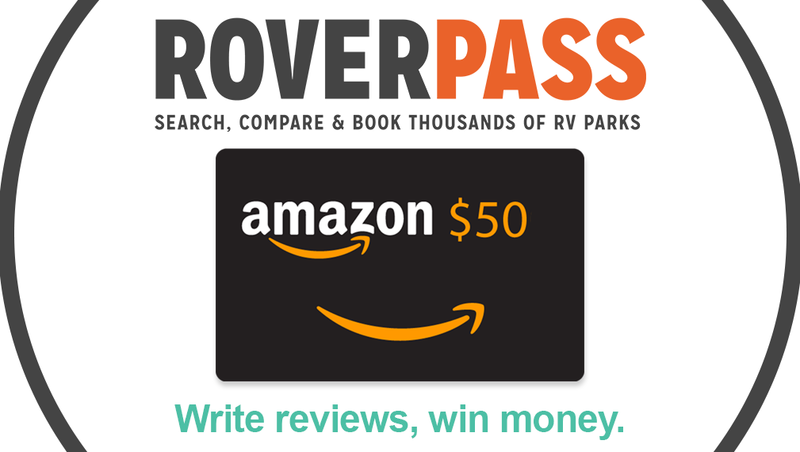 Rather than a photo slideshow, this RV park provides a carousel of rotating user reviews from top review sites like Yelp and Trip Advisor. On the front page, potential guests can navigate from the site’s social media sites to useful articles – like one that explains rip currents and warns guests about the water’s ability to whisk even strong swimmers out to sea (plus tips on how to swim back to shore!). The park’s contact information, map, video tour, blog, and photo gallery are easily accessible from any page. Google’s mobile friendliness ranking is a “good” 96 out of 100. When you decide to work with a website developer, be sure you know some of the top design elements that browsers look for when ranking sites in your industry. It could be the difference between snagging the number-one spot in your category, or appearing, unhelpfully, on page two, three, or beyond. ⟵6 Celebrity RV Owners: They’re just like Us…If we were Millionaires!